On May 29th, NCLEJ’s staff, Board, and 300 guests celebrated the accomplishments of three outstanding individuals – Marc Lawrence-Apfelbaum, Nan Aron, and Neal Katyal – at our annual benefit awards dinner at Chelsea Piers in New York City. 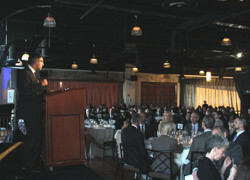 The event raised more than $550,000 to support our efforts to fight for fairness for people in need. It was a great evening – led by NCLEJ’s Board Chair Jennifer Selendy and Board Dinner Committee Chair Doug Curtis. Honeywell’s Katherine Adams and Steve Witzel from Fried Frank contributed to the evening as award presenters. View the dinner journal or a photo album on our Facebook page.